Hi, all! I’m just popping in to share my card for the newest Create a Smile challenge. The new theme is ‘crafty friends.’ What a great theme to create around, right?? Hello! I’m back with another post today, this time for Create A Smile! We have a new challenge going on and the new theme is “stamp a background.” I tried to think outside the box with this one, and here’s what I came up with! Instead of coloring the image I stamped, like I normally would I colored the background! 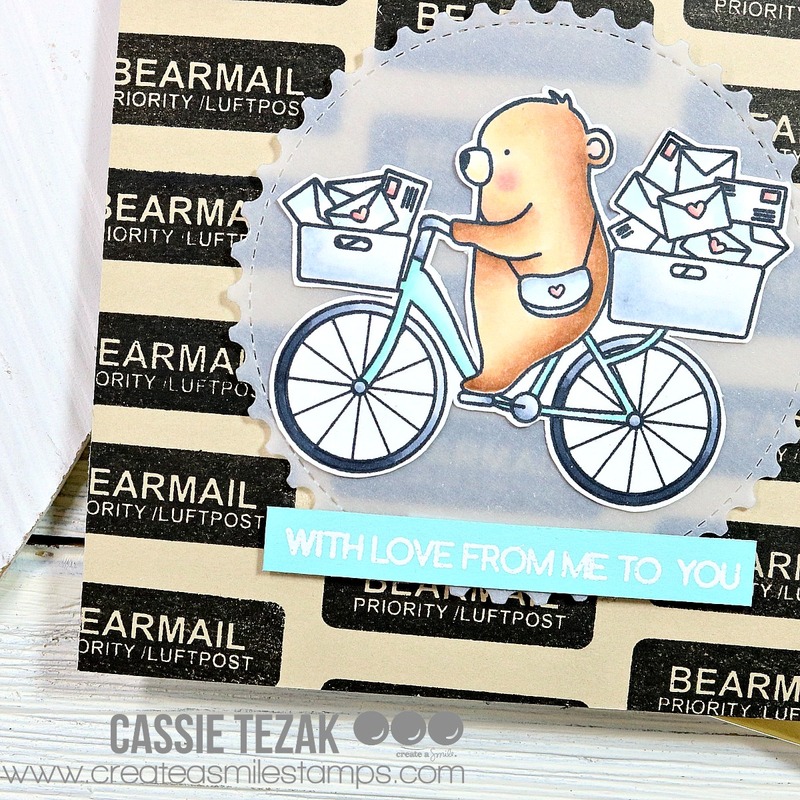 I stamped this adorable sloth from the Poppin’ Over stamp set in rows across an A2 size card panel. Each time I drew a line with my ruler before stamping to ensure I got them straight. Once they were all stamped I did simple coloring with my Copics to create the rainbow background. The only color I added to the sloths was some pink to their cheeks. I also splattered some white paint over the panel, just to distract from any flaws in my stamping or coloring. Plus, I love splatter!! Create A Smile March Release! 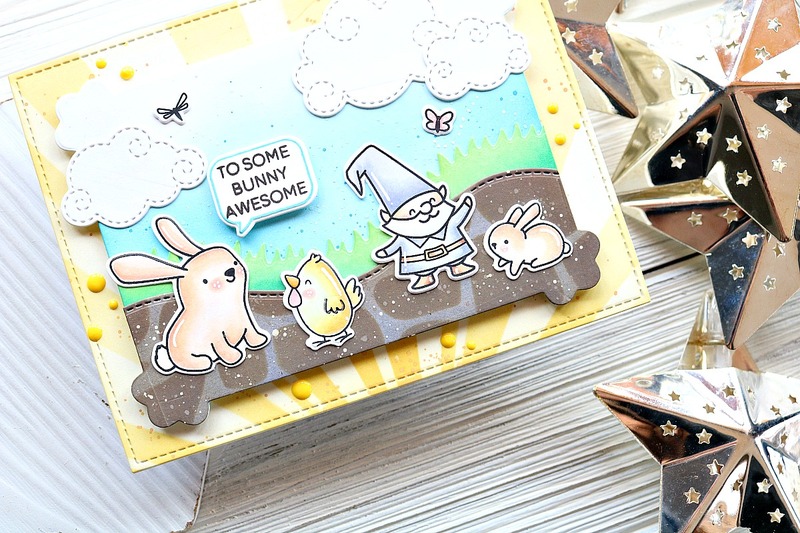 I just love the cute Easter eggs and adorable chicks and bunnies in this set. If you haven’t yet, be sure to head over to the Create a Smile shop and see the entire new release, as well as the design team’s awesome creations using it! Thanks for stopping by today, and I’ll see you again soon with another card! Create A Smile Sketch Challenge! I decided to use one of my favorite stamp sets for this card, To The Moon. Once I knew I was using that, the design came together effortlessly! I die cut a circle and ink blended it to look like the moon with some yellow inks. I also ink blended a background with blue inks and splattered lots of white and shimmer over it to look like a beautiful night sky. Next I stamped and colored a couple planets from the stamp set as well as the astronaut. I fussy cut them out and started putting my card together! The moon was popped up with foam tape, and the planets were tucked behind it. Before I applied the adhesive I did stamp a sentiment from the stamp set at the bottom! Luckily I didn’t forget to do this before I had added the foam tape-as I often do. And that was my card for today! I highly recommend that you head over to the Create A Smile blog and see the rest of the teams projects. They’re lovely. Also, when you’re there, you can play along with us! Thank you so much for stopping by today. I hope you have a great day, and I’ll see you again soon with another card! Hi, everyone! 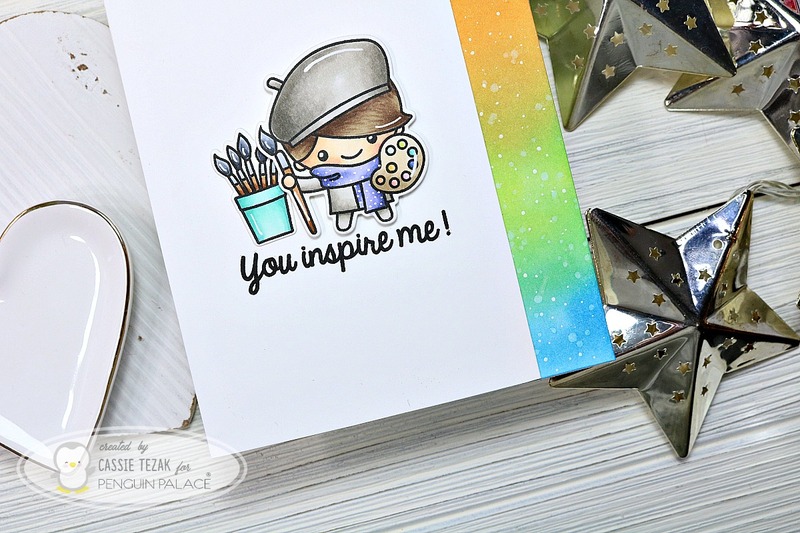 It’s Cassie here, and I’m so excited to be sharing a card for Create A Smile! 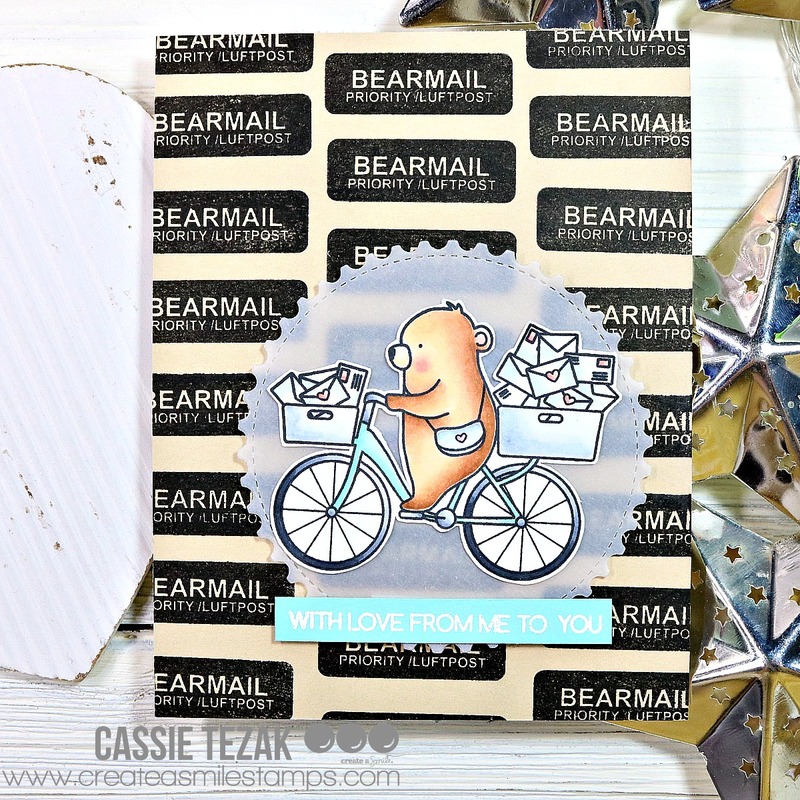 Today I’m sharing a cute card, where I made my own patter paper and got to color an adorable bear. Let’s take a look. I started the card by stamping the Bear Mail stamp all over a piece of 4 1/4 x 5 1/2 size piece of kraft card stock with VersaFine Onyx Black Ink. I used this because it is a very dark black and stamps really well over kraft. Next I stamped out the bear on the bicycle, and colored him in with my Copics. How cute is he?! The I die cut a Postage Stamp Edge Circle die from vellum paper to adhere the bear to. Once the two were adhered I used foam tape to attach them to the card. Then I stamped a sentiment from All About You onto some blue cardstock with VersaMark ink and heat embossed white embossing powder over top. I trimmed that down and adhered it to the card with foam tape. I just love all of the products used to make this card. They are some of my favorites from CAS. Be sure to see even more over at their blog and check them out on social media! Thanks so much for stopping by today, and I’ll see you again soon with another card! Hi, friends! Happy Saturday. I’m so happy it’s the weekend. Time to get crafty! I’m back today to share a card I made for Create A Smile. I’ve been really into the spring cards lately, and I think it has to do with not getting enough sunshine! So, today’s card is very bright, springy, and sunny! I started the card for today by taking a piece of 110 lb white card stock and doing some masking. I used the Cart Full of Treasures stamp set for this. There are some adorable potted plants in this set that I thought would be perfect for sunny scene. I stamped them along the bottom of the card panel, masking them off so that they could overlap. I colored them in with my Copic Markers. Next I used the Focal Point stencil and created a sun burst above the flowers. I used Fossilized Amber for the stencil, and then I blended some in from the sides to add some warmth and color to the rest of the card. I didn’t bother masking off the flowers, instead I just faded the color towards them. Over the top of the sunburst I heat embossed the large ‘friend’ stamp, from Friends Like You, with white embossing powder. To finish the card I heat embossed the remainder of the sentiment onto a small Scalloped Rectangle die from CAS. I attached that with some foam tape, and added some white gel pen details over the card, and it was complete! I hope you enjoyed this sunny card for today made with Create A Smile products! Hi, everyone! I hope you all are having a wonderful Saturday! I’m excited to share my first card as a Create a Smile design team member. I decided to use one of the sets I was most excited for, Gull Gang. I stamped out the images from the set that I wanted to use, and colored them in with my Copic markers. Then I fussy cut them out. Next I die cut one of the Cool Cuts Postage Edge Circle dies and did some ink blending to make it look like a beach. On the sandy portion I spritzed some watered down brown and yellow inks to make it look textured. Then I adhered my images to the circle. 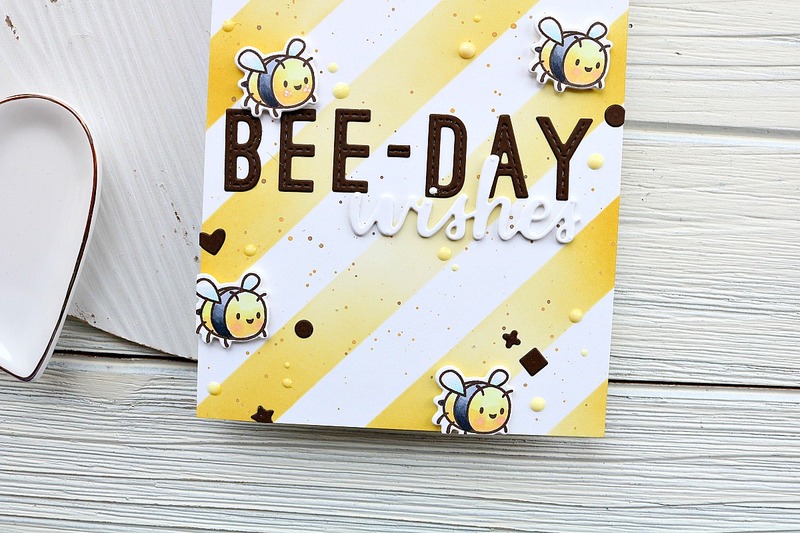 I also stamped the ‘be mine’ sentiment from the set and heat embossed some gold embossing powder over it. I trimmed that down to strips. Next I got to work on my background. I ink blended Worn Lipstick, Spun Sugar and Tattered Rose inks over an A2 size card panel. Then I used the Under the Sea stencil and ink blended some Worn Lipstick over the top. I made sure to make it darker at the bottom so that you could see the fish over the darkest part at the bottom. Then I splattered some Worn Lipstick ink watered down and white paint over the entire piece. I added my die cut pieces and sentiment to the card panel once it was dry and that was my completed card! I hope you enjoyed this Valentine’s Day card! Valentine’s Day is right around the corner and I need to start getting cards ready to mail out. Are your Valentines ready to be sent out?! Thanks so much for stopping by today! Thanks so much for stopping by, and I’ll see you again soon with another card! Hello, everyone! How’s your week going? Mine has been busy, busy, busy! But I’m happy to be back sharing a card with you all 🙂 Today I’m sharing a card I made for Create A Smile’s newest challenge. The theme is “friends,” and who couldn’t think of a friend to send a card to?! I started the card for today by die cutting a couple of the Cool Cuts Postage Edge Circle Dies from an A2 size card panel. On another card panel I ink blended I ink blended Blueprint Sketch and Broken China on it and the larger circle that I die cut. 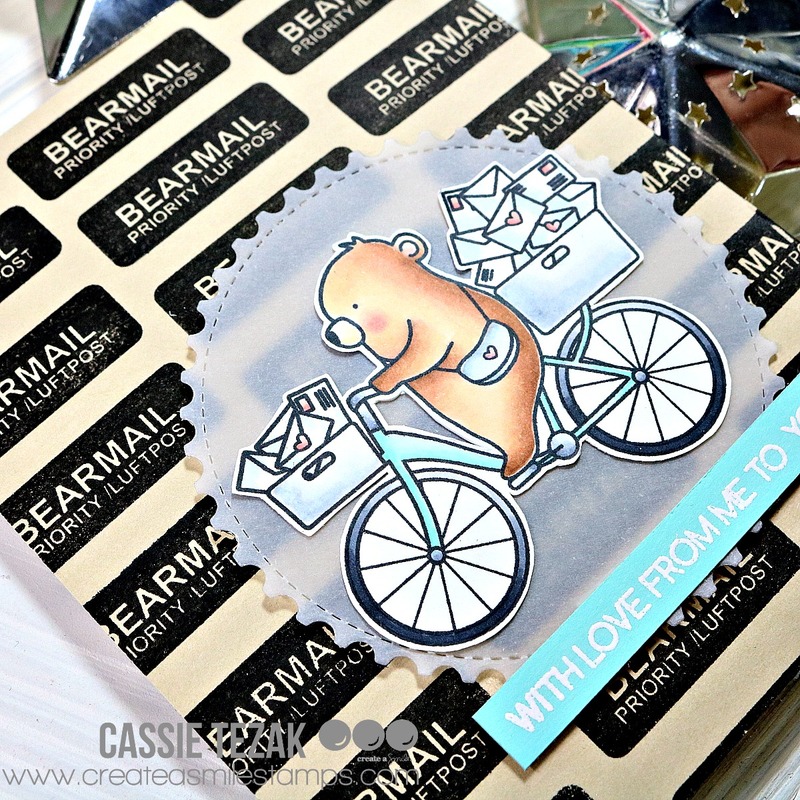 Next I stamped out two bears from the Poppin Over stamp set and colored them in with my Copic markers. The animals in this set are so cute! I love that they have little paws that can peak over the edge of something. After adhering the die cut panel to my ink blended background I glued the bears down so that they were doing just that, peaking over the edge of the circles. One paw I did pop up with foam tape so it looked like it was bent over the circle. To finish the card I put together a sentiment from Friends Like You and Bear Mail. I heat embossed some white embossing powder onto black card stock and trimmed the pieces down into strips. Then I adhered them to the larger circle die that I had adhered back into place with more foam tape. After adhering the panel to a card base my card was complete! We’d love it if you joined us for the new challenge! All the information is on the Create A Smile blog, as well as the rest of the challenge design team’s creations! Thanks so much for stopping by today 🙂 I’ll see you again soon with another card! It’s been so long since I’ve done any type of water color! I had these colors in my head and initially wanted to ink blend them, but wasn’t liking how it was playing out. So, then I had the idea to do a little watercolor burst to bring the eye in, and create the background for my scene. I used the Distress Oxide colors Tumbled Glass, Worn Lipstick and, my new favorite, Dried Marigold. I didn’t let them mix too much in the middle, and made sure to splatter the colors all over for a messy look. Next I stamped out and colored the adorable images from the To The Moon stamp set and fussy cut them out. I made sure to do my best to color match the Distress Oxides that I used for the background. It’s not 100% perfect, but close enough! I adhered all of the pieces down flat to the dried water color background with some tape runner and attached the panel to a card base. The final step was to stamp out my sentiment and trim it down to fit on the card. I didn’t want it to take away from everything going on, so I used a white cardstock and black ink. The sentiment was popped up with foam tape to give it a little dimension. And that’s it for my card today! If you want to play along with us be sure to link to your creation over on the Create A Smile blog! Plus, see the rest of the teams projects, and get inspired! (Trust me, there are some great projects over there!) Thank you so much for stopping by, and I’ll see you again soon with another card!